Heritage pua kumbu pieces on display at the exhibition. Some of them are part of Welyne's personal collection. 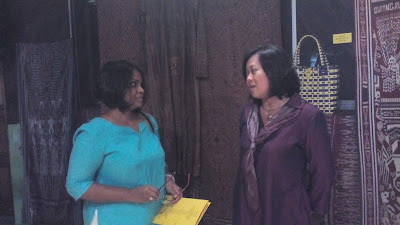 Dayan De Silva and I attended the Pua Kumbu exhibition at the University of Malaya, on 12 July 2015. 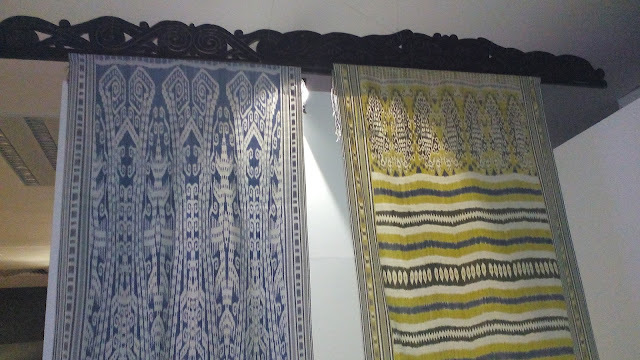 For those unfamiliar with the term, pua kumbu, is a traditional hand-dyed, hand woven ceremonial clothg, originating from the state of Sarawak (a part of Malaysian Borneo). Pua kumbu is created exclusively by the women of the Iban tribe, and the dyeing and weaving of this remarkable cloth is steeped in myths, rituals and taboos. About 10 of these women, who are master weavers, are recognised as 'living heritage' by UNESCO. projects which are mainly non-fiction and academic in nature. The Curator, Dr Welyne Jeffrey Jehom, walked us through the exhibition personally. 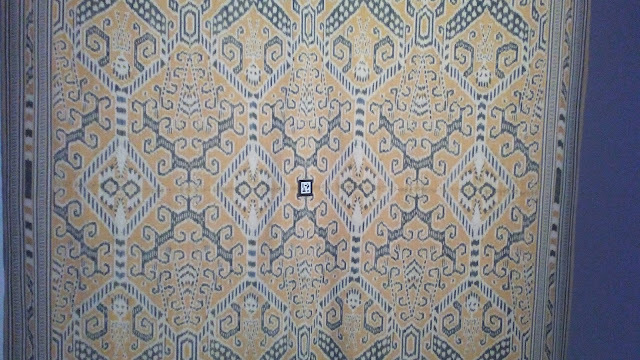 It's not often that this happens, but we were impressed with absolutely everything: the beautiful pua kumbu pieces, the research behind the artefacts and the audio-visual presentations and the animation of the myths encoded the textiles. Being a writer myself, I've heard the terms 'weaving a story' or 'bringing the different strands/threads of a story together' often enough and in the case of pua kumbu, a story is literally woven into the cloth. Why is telling a story similar to weaving a cloth? Perhaps these expressions in English arose from the weaving of tapestries, which often served as a medium to record an event. 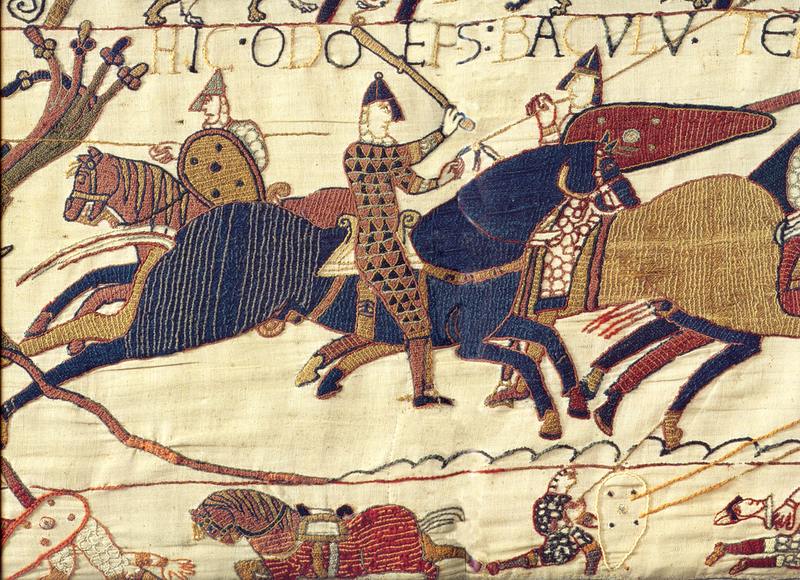 The most famous textile art in history must be the 900 year old Bayeux Tapestry, which tells the story of the Norman invasion of Britain. A small part of the Odo Bayeux Tapestry - royalty free image from Wikipedia. The Bayeux Tapestry is an embroidered cloth nearly 70 metres (230 ft) long and 50 centimetres (20 in) tall, which depicts the events leading up to the Norman conquest of England concerning William, Duke of Normandy, and Harold, Earl of Wessex, later King of England, and culminating in the Battle of Hastings. The tapestry consists of some fifty scenes..., embroidered on linen with coloured woollen yarns. It is likely that it was commissioned by Bishop Odo, William's half-brother, and made in England—not Bayeux—in the 1070s. In 1729 the hanging was rediscovered by scholars at a time when it was being displayed annually in Bayeux Cathedral. The tapestry is now exhibited at the Musée de la Tapisserie de Bayeux in Bayeux, Normandy, France (49.2744°N 0.7003°W). Back to the exhibition - Dr Welyne, who is from Sarawak, said that the exhibition was the culmination of three years of research among the Iban longhouses of Sarawak. 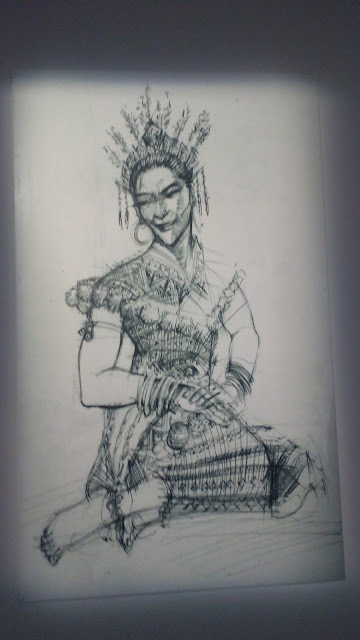 One of her discoveries was that different pieces of pua kumbu made by different tribes may actually code different parts of a longer story i.e. the cloth from one village may have the beginning of a story, a weaver from another village may have the second part etc. 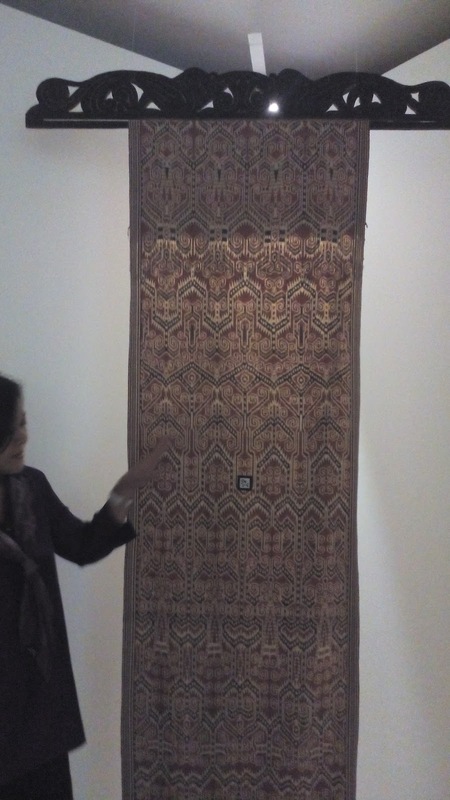 She found out that the weavers themselves did not know this fact and she decided to piece together several myths based on her interpretation of various pieces of pua kumbu. 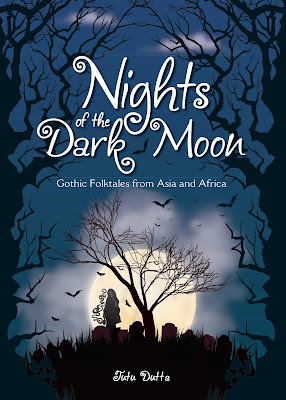 wait for Welyne's forthcoming book for the whole story! The other surprising piece of information from Welyne is the fact that pua kumbu has gender - some pieces are considered to be male and some are female. These two pieces are 'female' pua kumbu. 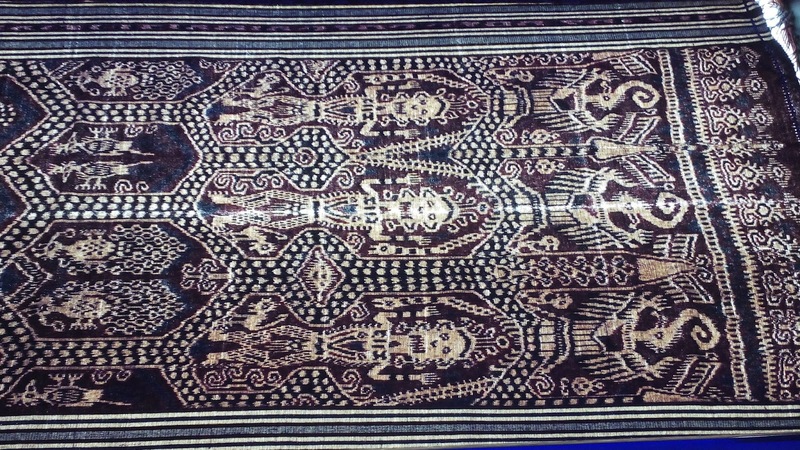 Another interesting fact is that, every piece of pua kumbu must have a provenance. The weavers must know the story behind the cloth they are weaving; they would never attempt to weave a particular pattern if the weaver who first created it passed away without telling them the story behind it... 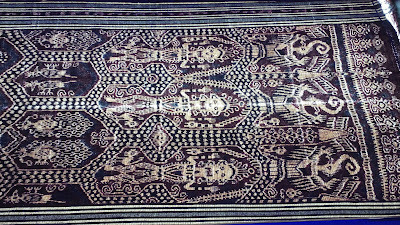 Similarly, there are patterns which belong exclusively to longhouses with a head-hunting tradition and it is taboo for weavers who did not come from such a heritage to weave these patterns; however, longhouses which did not practice head-hunting in the past also have their own special heritage pua kumbu designs. The metaphor is obvious; you tell a story like you make clothing. Repetition and pattern, moving the story along a path like a piece of thread you're spinning, putting large pieces together, crafting small pieces carefully, to get things put together right. It's art and it's craft and it's a valuable skill. Especially in a non-literate society. 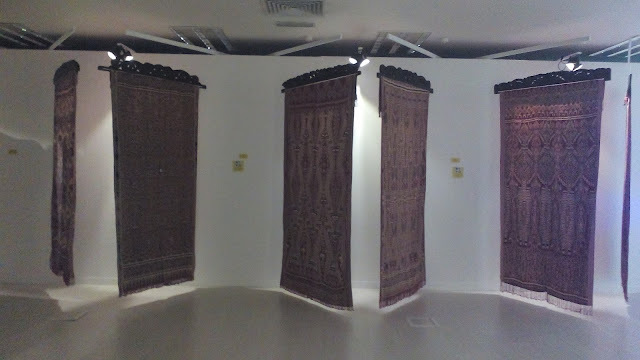 These pictures taken at the Pua Kumbu Exhibition at the Art Gallery, Chancellery building, University of Malaya. Yulianto Qin songket like other traditional woven cloth culture basically have a deep meaning encoded in it (folklore or even mantra for religious purpose). Sumatran songket (especially palembang) have more than 1000 different pattern each of which is supposed to be used for specific purposes. But in modern fashion society, songket (and other traditional woven cloth) is more widely used because of the beautiful pattern. Jane Ferguson I had no idea it was so involved and educational. 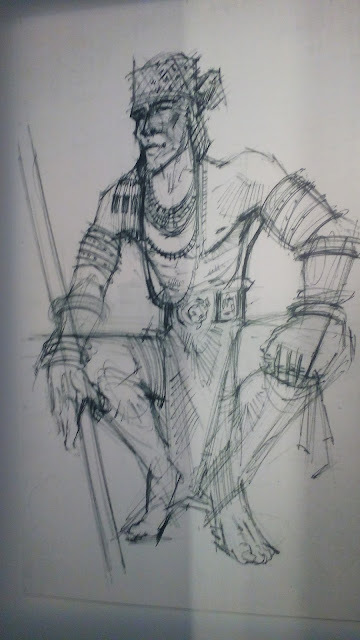 I have an awful lot to learn About spinning yarn and weaving tales. Ampusam Symonette Wow I am educated today as well Thanks Tutu and friend. Gopika Nath Thanks Julia. What a lovely post. Sharing. Julia Dutta Tutu, and Gopika, might like to become friends on G+? Both of you are so rich is experience and have some common things to share? Susan Colli Fascinating, Tutu! Thank you for this interesting information. Thank you too, to all the others that contributed to this..so happy to learn something new!